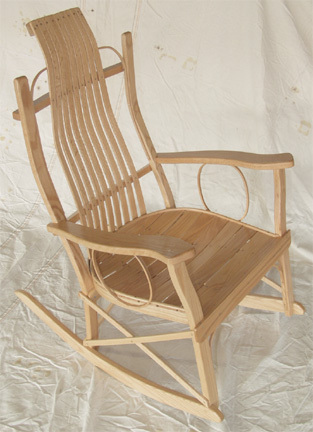 Here is another of our many styles of rocking chairs. This one is a bit more fancy and has a very comfortable contoured back and decorative trim. We also swing away from the traditional solid seat in this case, going with a slatted seat more reminiscent of the past. Shown here in a light oak finish.